More good news! 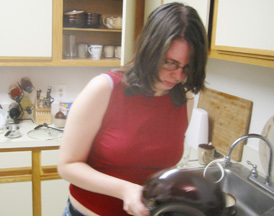 Again Jennifer got a report of "no significant changes" following analysis of her latest (1/4/06) MRI. The machine they used this time was newer and more powerful, and able to record more detail, so we are particularly glad that nothing new showed up. 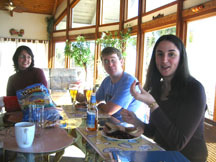 We rented a house at the beach (St. George Island) after Christmas, and had a good and relaxing time. Jennifer's friends Lisa and Denis came to visit us there, as did several others, and we all enjoyed unusually good weather. Tuesday Jennifer starting working half-time at COAPS (Florida State University's Center for Ocean-Atmospheric Prediction Studies) in Innovation Park. This is a research and development center in southwest Tallahassee that also contains the National High Magnetics Field Laboratory. She is doing general office work such as typing, data entry, copying, and cleaning. She still has time to work on her wedding planning, and take the occasional nap. Jennifer with Denis and Lisa in the beach house, and Jennifer in front of the setting sun on the beach at the west end of the island. We had a good last visit with Jennifer's doctor in Gainesville, as Jennifer basked in praise for her progress. This weekend she is enjoying Winston's visit, although a delayed flight meant he didn't get here until mid-morning yesterday and he has to leave again this evening. Today the four of us were invited by Winston's father to Lucy Ho's restaurant for a lunch provided by Lucy to a Chinese choral group and the Chinese-American Student organization, in honor of the upcoming Chinese New Year. Winston's father and Lucy are both members of the choral group. She also will be catering the wedding reception. 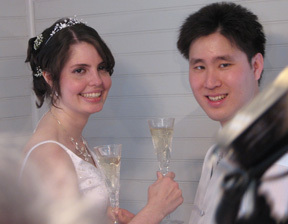 Jennifer and Winston have a wedding page at The Knot where they have put out some information about their upcoming wedding. My computer crashed at the end of January, and it's finally back in action. Since mid-January, Jennifer has continued to be active and busy with wedding preparation, and to work at her part time job at COAPS. We had a chance to visit with my Aunt Jaccie from Nebraska and her sister from Thomasville on January 18. On February 4, we went to an engagement party for her Jennifer's friends Josh and Kate. Josh is the twin brother of Jennifer's "brain buddy" Katie, and Katie was there along with much of her family and many good friends. Busy, busy, busy. We're all working on getting ready for the wedding. Jennifer is in great spirits. Last week was her last at her job at COAPS, and they took her out to a memorable lunch. It was especially memorable for the slow service and the multiple dropped plates, but her coworkers still made her feel much appreciated. Last week a group of her friends from around Florida—and Lisa, her Maid of Honor from Boston— took Jennifer on a girls-only weekend in St. Augustine. Jennifer thoroughly enjoyed the festivities and the company. Now it's back to wedding-plan work, for one more week. Jennifer and Winston are married! The wedding yesterday was wonderful. Winston was handsome, Jennifer was radiant, and everyone was tremendously happy. 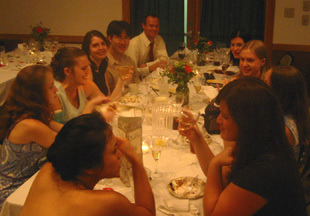 Jennifer and Winston toast each other at the reception. Photo provided by Liang Yu, Betty, and Andrew Hsia. The festivities started Friday with the rehearsal and rehearsal dinner, peaked with the wedding and reception Saturday, and continued with a party Saturday night and brunch at our house this morning. Everyone had a chance at one time or another to catch up with all of the old friends (and new ones), and truly celebrate. 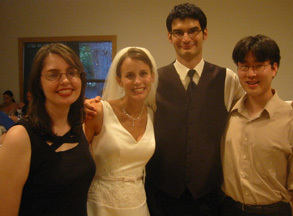 Jennifer and Winston are very grateful to the many people who helped make the wedding and related celebrations possible. Many people have taken pictures and are sharing them with us. We will be making them available shortly. Jennifer and Winston returned from their honeymoon in the Hawaiian Island of Kauai Tuesday. They were tired after the long overnight flight from Honolu to Atlanta, but happy. They spent a few days here resting, and opening wedding presents. Thursday Jennifer had an opthalmogy appointment, and Thursday night we went to a multi-course traditional Chinese dinner at Lucy Ho's, hosted by Winston's father for us and many of friends. Winston and Jennifer rented a minivan Friday and packed it with wedding gifts and some of Jennifer's belongings for the trip to Virginia. They left Saturday morning, and arrived safely in Falls Church late Saturday night. I'll post pictures they took during their honeymoon when they send them to us. Jennifer and Winston came back to town late Friday for Josh & Kate's wedding. Josh is Katie Doyle's twin brother, and Katie is the young lady featured on a link at the top of this page. Ursula and I were invited too, and we saw Katie there—looking as beautiful and animated as usual. Jennifer and Winston continued celebrating at a brunch for out-of-town wedding guests this morning. Winston's Dad joined us today for an early dinner at Sonny's before Winston's flight this evening. Then his flight was canceled due to bad weather, and he is now scheduled to leave early tomorrow morning. Jennifer will stay here for a few days so she can see her sister, Monica, who will arrive tomorrow from North Carolina and stay with us until she leaves Saturday for a Habitat for Humanity project in Thailand. Jennifer finally was able to get all the arrangements made for an MRI, and an evaluation of the MRI by her new doctor in Falls Church Friday. The results were good, as they have been for more than a year and a half: no change. Jennifer and Winston flew down to Tallahassee on August 11 for the wedding the next day (in Gainesville) of Erika and Dan. Erika is an old friend from high school, and one of Jennifer's bridesmaids. Ursula and I were invited too, and we all had a great time catching up with old friends. 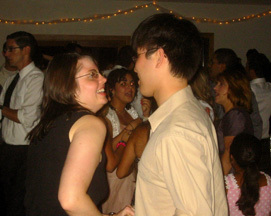 Jennifer and Winston also enjoyed dancing after dinner. Winston flew back on Sunday, but Jennifer came with us as we drove up to Chapel Hill to see her sister, Monica. 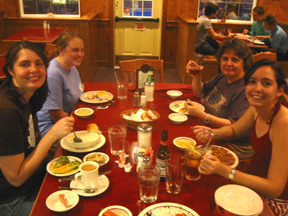 While there we had a down-home dinner at Mama Dip's, where Monica's roommate Maggie (in the blue shirt) joined us. Ursula, Jennifer, and I then drove on to Jennifer and Winston's apartment in Falls Church. We spent several days as tourists there and in nearby Washington DC, and evenings dining out and in with Jennifer and Winston. 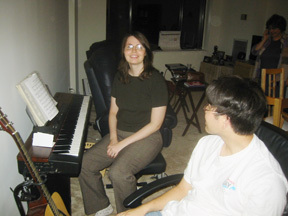 Both of them played for us, and Jennifer did a little cooking for us too. Ursula and I then made the long drive home, with a stop to see Monica in Chapel Hill again. Good news again for Jennifer! She had another routine MRI last week, and once again it showed no change from the previous one. Jennifer is now working at a tea store in the Tysons Corner mall near Falls Church. She's not used to spending hours on her feet, but she's coping...and she can indulge her love of tea, as they encourage her to stay familiar with their offerings.